Vendors of internal gear bicycle hubs naturally give the transmission ratios of own products. But I was always curious how exactly these ratios are obtained, i.e. which planet gears are engaged in which combination and how many teeth each gear has. This information was surprisingly hard to find – in fact, the only vendor who discloses this is Rohloff! It is certainly possible to just disassemble the hub, but, you know, sitting half-day at the computer screen is more attractive nowadays 🙂 I have Nexus-7 hub on one of my bikes, and I have “reverse engineered” the exact tooth counts. I found the service instruction in German, explaining which planet rings are transmitting the torque in which gear. This, plus the transmission ratios with three decimal digit precision, plus some general theory proved to be sufficient. Update: No! The numbers below are wrong. You may think, how this can be seen from them. See the real counts from the disassembled hub for correct counts. To understand the numbers below, you must know that Nexus-7 has two planet carriers; each has planets with two bound gears. One of them meshes with the ring gear. Each of planet gears meshes with corresponding sun gear. The latter can be rotating freely, or fixed to the immobile axle with pawls, activated by the shifter. In gears 1 and 2, only the first step-down ring is engaged. In gears 6 and 7, only the second step-up gear is engaged. Read the service instruction linked above for further information. I give values for the active sun, planet meshed with the sun, planet meshed with the ring, and the ring. Next, the exact fractional ratio is shown, and it’s decimal value with 5 digits. Last in the line is the 3-digit decimal value from the manuals. We see the rounding errors (and sometimes inconsistencies). The inspiration for this feat was John Allen’s table of tooth counts for various hubs. John did this by some guessing-and-trial-and-error, putting numbers in a spreadsheet with the formulas. Unfortunately his data does not include the two hubs I have, Nexus-7 and Nexus-8. I decided to leave the guessing to the computer and wrote a script, which does exhaustive search over all reasonable combinations. There are two restrictions on numbers of teeth in a working planetary gear (diameters should add up in a known way, and some counts must be divisible by number of the planets for them to be equally spaced; ask me if you want to get techy). Allowing the precision of the resulting ratio down to the last decimal number given in the documentation, the search returned just one result for both planet rings of the Nexus! I was so delighted to get such a consistent answer. Update once again: this “consistent answer” is wrong. Here is the right one. You sir just made my day :-). After taking this thing apart (starting from the wrong side) I had some trouble putting it back together in the right order. Especialy the springs in which seems to be the “internal assembly” gave me some trouble because I (stupidly) dis-assembled most of the “internal assembly” from the wrong side of the hub without a clear view of how the parts fit together. (not recommended). The rest of the world (including Shimano) only seem to have parts lists. I took apart his EUR15 second hand hub because I didn’t know if it was worth my time and money. 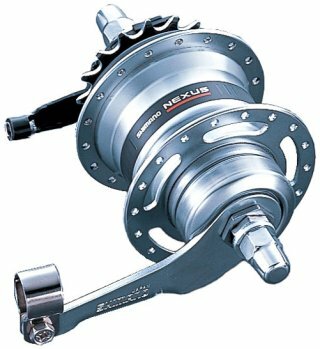 But because it seems well made and almost new I guess its time to go buy a rim and some spokes to make this hub (and me) happy.